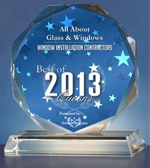 NY Window Service | NY Glass Repair | All About Glass & Windows, Inc. Complete Glass & Window service for the 5 boroughs of New York and beyond for 3 generations! Welcome to All About Glass & Windows, Inc.
All About Glass & Windows, Inc. services a wide variety of well-known landlords, management companies, city agencies, museums and private homeowners. In an industry where poor service and lack of quality workmanship has become the rule, All About Glass & Windows, Inc. is the exception. Our solid reputation speaks for itself. As a leader in the glass and window industry, we strive to provide unsurpassed service, quality workmanship, reliability and reasonable prices to establish and maintain long term business relationships.